Under the new editorial board, the Journal of Cutaneous and Aesthetic Surgery (JCAS) has completed 1 year. It is time to review how we are performing. JCAS was handed over by the previous Editor, Dr. Venkatram Mysore and his team in a very healthy state. The previous editorial board and the publisher got the journal indexed in PubMed. They started from scratch in the year 2008 and quickly made the journal widely popular. There could not have been a better platform to go on from. It was important to take the journal forward from where we got it. We have analysed the performance of the journal over the past year, and I am happy to say that we are on track. The submission rate has consistently gone up during the past 3 years, and as expected, the acceptance rate has come down from over 80% to just half, in spite of the fact that we have increased the frequency of publication from 3 per year to 4 per year [Figure 1]. Similarly, the editorial board is actively trying to reduce the time taken for editorial and review process. The time from first submission to acceptance has come down from around 100 days to just around 50 days. The editorial board is especially thankful to the reviewers for ensuring a quick disposal of the submitted papers. Not just this, we are trying to ensure publication within 6 months of acceptance. 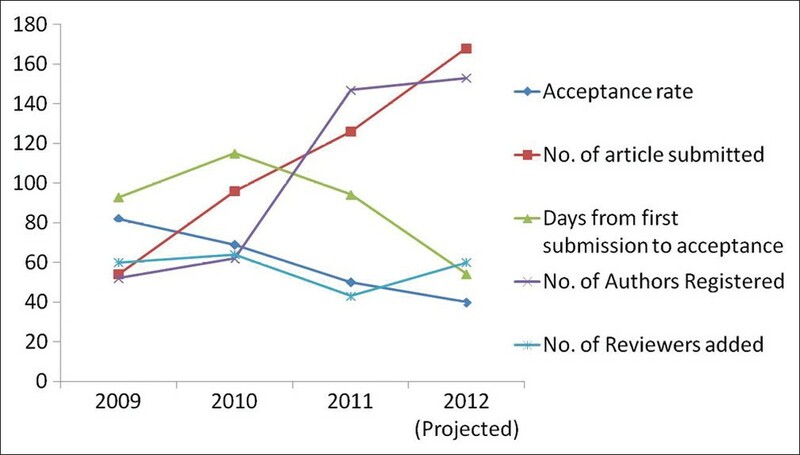 The number of new authors registered every year has also increased, although the number of new reviewers invited remains constant [Figure 1]. We need to improve in this area. The journal is getting more and more attention from the readership across the World. In the past 10 months, the number of papers downloaded every month has increased three times, from less than 6000/month to over 18,000/month [Figure 2]. This shows the increasing popularity of the journal. I personally thank my colleagues in the editorial board, advisors, reviewers, authors, and readers for their support to the journal. Last but not the least, a special thank to Medknow/Wolters Kluwer Health who have made this journal visible across the World.